The goal of warehouse operations is perfect order fulfillment: to deliver exactly the items a customer ordered, on time and with optimal efficiency. The warehouse module of an enterprise resource planning (ERP) solution can help smaller warehouses achieve this goal. 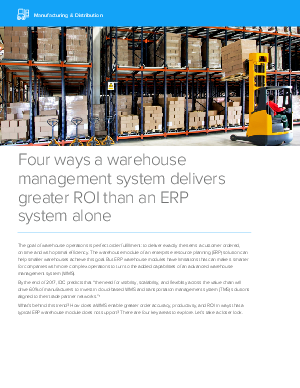 But ERP warehouse modules have limitations that can make it smarter for companies with more complex operations to turn to the added capabilities of an advanced warehouse management system (WMS). By the end of 2017, IDC predicts that “the need for visibility, scalability, and flexibility across the value chain will drive 60% of manufacturers to invest in cloud-based WMS and transportation management system (TMS) solutions aligned to their trade partner networks. Download this paper now to find out more.